That libraries are jumping into social media with the same joy that small children evince about jumping into swimming pools on hot days is indisputable. Measuring the impact of these social media is another thing altogether. Michael Porter, Communications Manager, WebJunction, and Amanda Clay Powers, Virtual Reference Librarian, Mississippi State University Libraries, walked their audience through the process of analyzing, evaluating, and communicating the value of web presence, while admitting we’re at an early stage for this. Even counting the number of tweets, for example, can be problematic. Transforming numbers into data that means something for the library’s administration, board, and even skeptical co-workers is a greater challenge. I found it interesting that many in the audience were not yet even attempting to write ROI reports on their social media activities. Clearly this is an area that needs much more attention. Other people may also have quoted him, in one of the many sessions I wasn’t able to attend, given how spread out the conference was. I actually think the sentence that follows the one quoted is equally pertinent, “The invention of a tool doesn’t create change; it has to be around long enough that most of society is using it.” Librarians are talking about, and using, a wide range of new social media tools to communicate both within and outside the profession. They blog, Flickr, Facebook, FriendFeed, Twitter, receive and send RSS feeds, wiki, IM, podcast, vlog, tag, bookmark, and share like mad. Some librarians are beginning to find these tools boring, but others are just getting started with social technologies. Plus, most of society isn’t using them. Issues surrounding the social media, 2.0-type tools, include measuring the impact, ROI, not getting too far ahead of library users, data ownership, loss of context, permanence versus ephemeral, and involving library staff and administration. Need help justifying your existence? Who doesn’t these days. 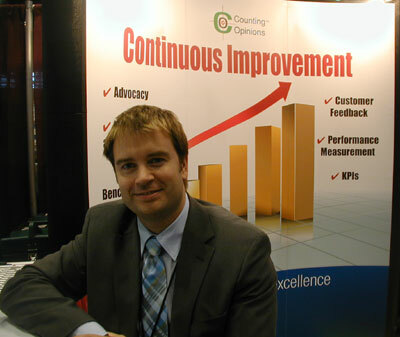 You may find help from a company called Counting Opinions, one of the exhibitors at the ALA Expo this year. According to the headline on its promotional brochure Counting Opinions offers “Evidence-based management for advocacy and continuous improvement” at your library. I spoke with company representative Ian Reid yesterday, who outlined what the software package can do for you, including a module that supports the measurement of patron satisfaction via surveys and web form tools that you can customize. The software can also help you track, monitor and assess core performance indicators, including tracking book circulation data and door counts to produce metrics and indices. “It consolidates all performance information to get a 360-degree view of library operations,” Reid said. The company has been in business a few years, but recently has made a special push toward helping academic libraries track and manage their performance. Subscription prices are calibrated to the type of library, so you will have to inquire for full details. But, especially this year, it might be something worth looking into. “Why settle for anecdotes when you can have hard evidence?,” Reid said.